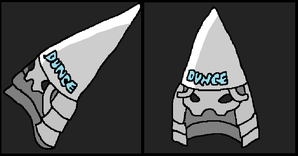 This disgraceful kind of pointy hat is given to heroes who were really unruly at school. If your hero has this hat, then he was really well-known at school (in not so good a way). However your hero must have kept it for a long time and improved this hat to be a protective armor. This page was last edited on 11 February 2019, at 11:03.